My dad and I on the top of the ridge. Right after Christmas my dad and I went on our yearly ski trip. This years we headed over to Wenatchee for a few days of skiing/boarding my favorite hill: Mission Ridge. It is the ski hill known for having the most clear days in Washington state. Again, It did not disappoint me. We had great viability looking over the sea of clouds sitting above Wenatchee. I had also just gotten a new camera to replace the one I lost in a Chinese taxi and since it was the shock-proof and weather-proof Nikon Coolpix AW100 I had to test it out. We had some nice snow and we were able to fly down the great bomber runs. The ridge behind us was casting cool shadows on the clouds below. On the second to last run of the day everyone on the slopes stopped to watch the full moon rise over the horizon. Awesome weather and groups of people going up to touch the Crashed B-24 Bomber wing for good luck. A snowy view of the Enchantments in the distance as seen from the top of Mission Ridge. The microwave tower, ski patrol shack, and the windblown trees of ice on top of the ridge. Me crossing the last snowfield on top of High Pass. Back during the summer I was looking at my huge map of the central cascades for some trails for my buddy Erik and I to hike. There was one hike that looked great. It was near the cabin at Lake Wenatchee, had some elevation promising good views, and made a loop that looked like it could be accomplished in three days. The trail would also be a bit of a challenge for us. It was a few miles longer than anything I had hiked before and had a four mile segment that wasn't shown on any official maps. After doing a bit of research of the area on some backpacking forums we decided to go for it. A rough elevation profile of our hike. The mileage should actually be closer to 26 miles. In the first week of September there was a good gap of weather which promised nice conditions so we loaded up our packs and headed up to the mountains. Our trail started at the old Trinity mine site up the Chiwawa River and would take us up the ridge directly east of Glacier Peak, south over High Pass, down the Napeequa Valley, and finally over Little Giant Pass back to the car. A view looking towards Buck Mountain and the ridge that we would made our way over and down the back side. The first day of hiking was great. The Buck Creek Trail took us nine miles up a gentle slope to Buck Creek Pass where we camped the first night. The pass was a small maze of converging trails with a number of campsites scattered around. It looked like there were just two or three other people camped up there with a couple dogs. After setting up our camp we had a feast of instant mashed potatoes, stovetop stuffing, and brats. Mmmmm. Everything tastes better after a good hike. Mountain Bog Gentian, one of the more interesting wild flowers I found at Buck Creek Pass. Our campsite for the first night. Sunset with a faint silhouette of Glacier Peak in the distance. The next morning we started leg two of our journey: over the High Pass Trail and into the uncharted descent to the Napeequa Valley. The first section of trail was amazing. It traversed over and along the ridges which we had been looking up at the day before. The weather was clear so we had amazing views looking across the valley at Glacier Peak. We scrambled up some rocks to go sit on the crest of the ridge. The view looking down the ridge at Liberty Cap (left) and the Buck Creek Pass area down below. Glacier Peak, the 4th highest mountain in Washington. A panorama of the Buck Creek Valley we hiked up the day before. It is hazy due to the forest fire smoke. Triad Lake sitting just below the top of High Pass. From the trail reports I had read to research this hike, I learned that crossing over High Pass could be a bit treacherous. Since Erik and I didn't have the gear for safely crossing the the snowfields we had to watch every step. It wasn't bad across first fields which weren't very steep, but for the last section we decided it would be best to scramble up and over the rocks above snowfield rather than risk falling down the icy slope to the rocks below. Me with High Pass and the Clark Glaciers in the background. The snowfield on the far left is the one we had to make our way around. From the pass we followed the unmapped trail down the hanging valley into the Napeequa. From there the trail got a tough. Not the sort of tough where you lose the trail for a minutes, but the sort where you lose the trail for a full day. We weren't lost since we knew exactly where we were in this closed-in valley, but the trail just wasn't where we thought it should be. We followed several rough paths along the Napeequa River only to have them disappear in to dense thickets of alder. We gave up trying to find the real trail so we crossed the river and followed the deer trails through the tall grass along our side of the valley. It wasn't long before Erik and I were both frustrated and exhausted from a full day of hiking so when we finally found an old campsite along the river we threw our packs off and setup camp. Our camp on the south side of the Napeequa near Louis Falls. On the start of our 3rd day we could see on our map that we still had a good 12+ miles back to the car. That was a bit discouraging since we had no idea how bad the rest of the Napeequa Valley would be. We made our way through the woods along the river until we got to a nearly impenetrable wall of alder thickets. Our best way to get past it and down the valley was to wade the river while hopping between the rocks and alder along the banks. It was slow progress especially since the Napeequa is a cold river. The name means white water. Not the rafting sort of white water, but the silty, cold, glacial white water. We did this for a couple hundred yards before finding a path on the opposite bank which led to the real trail. Finally! But the mighty Napeequa Valley still had more to throw at us. Here I am pushing through alder thickets. Uggg. So here were are in the Napeequa Valley, tired, wet, scraped up from pushing through the brush, one bee sting on Erik, and we still have one more pass between us and the car. But good news, we were finally on a trail! It wasn't much of a trail, but it at least offered a route through the thickets. We still found ourselves going down dead ends or knee deep in mud from time to time. We encountered even more problems finding the route up Little Giant Pass. We had lost the main trail in the maze of deer trails through the tall grass so we didn't know exactly where to start our ascent up the steep ridge. After almost an hour of searching the hillside for the route and unsuccessfully trying to get a compass bearing on the featureless ridges around us, we spotted two hikers we had passed earlier that day so we followed their tracks up. The mighty Napeequa Valley. We hiked from that distant mountain at the end of the valley to where this was shot on Little Giant Pass using little to no trails. After a 2000ft ascent up the pass and a knee-breaking 4000ft descent back to the Chiwawa River Road we grabbed our victory beers we had stashed at the ending trailhead three days before and started the three mile walk on the road back to the car. Luckily we were able to bum a ride from one of the cars of hikers headed up the road. And the beers worked as an incentive for them to take two dirty, smelly hikers in their car. In the end, Buck Creek to High Pass to Napeequa Valley to Little Giant Pass was about 8000ft vertical gain and another 8000ft down over about 26 miles. It was the longest and most exhausting hike I've ever done, but I loved it. Awesome views and amazing wilderness. And thanks to Erik for being a great hiking partner and for a few of his photos I stole. After climbing to the top of the Purple Mountains with a group of friendly Chinese coworkers, they asked me if I would like to join them for dinner. That was an offer I couldn't turn down. They asked me what sort of Chinese food I liked, but all I had eaten in China was a few little noodle dishes, street food, and a feast of Peking duck. They all started throwing out ideas of where to go and they told me about their favorite restaurants in the city. They told me about Sichuanese food and they were surprised when I said I had never had hotpot (a big pot of spicy hot broth that you cook meat in at your table). 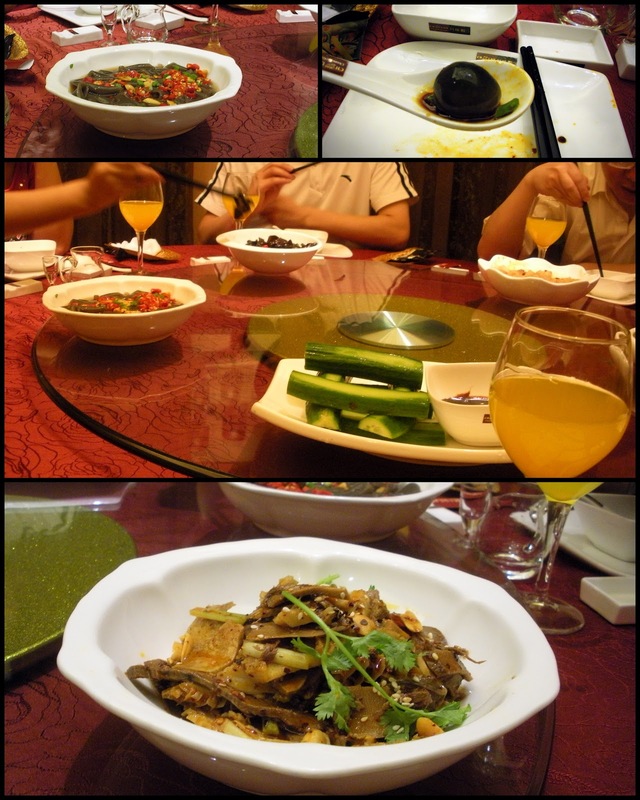 They also told me about the differences between Shanghai and Nanjing cuisine. Eventually they decide on a place so we make our way down the the mountain, hop on some buses, and head across the city as they point out sites and tell me about life in Nanjing. It was awesome! They knew just where to go. The girls having a little fun posing for photos on the way down the mountain. I had no idea where they were even taking me, but they told me that they would help get me back to my hostel by the end of the night. I'm not sure what the name of the restaurant was, but I got a picture of the front. When we got to the restaurant they led us into the back where they had a private room prepared for the group of us. We all sit down around the table and my new Chinese friend Amy grabs the menu and starts order for all of us. I took a peek at the menu which had amazing photos of all these dishes for about $3-4USD each. Amy would just flip through the menu, page by page, telling the waitress which dishes we would have. She knew which dishes were best and ordered us up about 25 different ones. The dish in front was the best thing I ate in China. It is a big bowl of broth with peppers, bean sprouts, a white fish, and an amazing spice which I think may have been Sichuan peppercorns. Eventually we picked out all the good stuff till the bowl was just full of hot peppers and broth. That isn't wine on the table. It was a sweet juice which I couldn't identify and no one knew the translation to English. Crispy cauliflower and behind it is a dish of shrimp and peppers in broth. As we ate our way through the dinner the waitress would take away the finished dishes and bring out even more to put on the table. It was an amazing meal. Everything was so good. My Chinese hosts were excited for me to try the different foods. I would ask what some of the dishes were, but for many they didn't know how to translate it. Other times they would wait for me to eat it and then tell me that it was frog or something else Strange. I had so many new things. The pigeon eggs were super good. They were cooked in a dark sauce so the egg was entirely black with lots of flavor (with an odd pigeon aftertaste). I didn't like frog so much. It think it was frog hips. There were lots of chewy chunks of cartilage and bones. The rabbit was probably the spiciest thing I've ever had. Many of the dishes were packed full of red peppers. Some seemed like it was 70% made of peppers which you just pick around. With dishes like the rabbit, when we done picking out the meat, all that remained was a mound of peppers. The group of us after the meal. If you look closely you'll see that all that's left of the dishes are the mounds of inedible peppers. It was so nice of all of them to show me around the city for the day and let me experience the best Chinese food I've ever had. And to top it all off, one of the guys covered the whole bill. Over my trip I've found that the Chinese people can be so friendly. I really enjoyed my time with them. Xuanwu Lake and the Purple Mountains. The large domed building is an arena called the sun palace. I hiked to the furthest peak which is about 1400ft above the city of Nanjing. My day in Nanjing started out awful. On my walk through the sprawling downtown core of Nanjing to find the train ticket office, I don't think I could have felt anymore lost or miserable. To begin with, the City of Nanjing is not English friendly like some of the larger cities in China are. There are little to none English signs and most other signs are only written only with Chinese characters. I could just barely find my way around town by comparing the tiny characters on my map with those written on the signs. To make things worse, the streets in Nanjing are horrible. The large tree-lined avenues are nice sight, but in the spring time they leave the streets below caked with thick pollen while the air turns into potent mixture of pollen, smog, and the ghastly smells of a crowded city. You don't even feel safe walking on the sidewalk because it is shared with masses of bikes and motor scooters which whiz past you beeping their annoying little horns. One of the quieter streets in Nanjing. This is the usual setup of a Chinese street. You have the roadway for cars separated from the special lane for parking and motor bikes. A group of men were all gathered around with their cages of birds playing Xiangqi (Chinese chess). After about 3 hours of wandering around this deceptively large town and finally buying my train tickets for the next day, I made my way to Xuanwu Lake. I couldn't have been more relieved to get out of the city and walk along the beautiful shores and causeways of this lake. The northern gate of the city wall. The Buddhist Pagoda at Jiming Temple. Xuanwu Lake sits just outside of the northern walls of Nanjing. Surrounding the shores is a park filled with several pavilions and a collection of causeways which connect several small islands with the shore. The islands in the lake center are filled will gardens, temples, statues, and a number of small stone bridges. I hopped on a small tourist tram-car tour which sent me around the islands. My tram-car made a few stops along the tour for us to get out and walk around the island gardens. Me and the Guanyin (Goddess of Mercy) statue in the lake. You can see that building from all over the city. My tour tram stopped at this small temple where I was offered incense sticks, lit them, and then bowed three times in front of an alter. Since the tour was all in Chinese I didn't really know what was happening so I just went along with it. From the lake, I made my way to the Purple Mountains just outside of the city. Around the two peaks are a number of trails, large mausoleums, and military areas where photography is restricted. I started hiking the mountain, but I had no idea where I was actually going since there were no signs I could read. Eventually I met a group of Chinese coworkers all out on a fieldtrip around the Purple Mountain for the day. Several of them could speak English and they offered to show me around the mountain and even gave me a few bottles of water. I ended up spending the rest of the day going around the city with them. The group of us nearly to the top of the mountain. A view looking over Northern Nanjing. Amy, a super friendly local who went out of her way to show me around the city. Me at the top of the Purple Mountain. I love the look of Chinese characters carved into trees. A radio tower with Xuanwu Lake and downtown Nanjing in the distance. Most of my days in China had smog like this. It makes it hard to get a nice clear picture of of the view from the mountain. In the last year I've had a few incredible opportunities to travel abroad which have taken me around South America and China. I started this blog so I could share photos and stories from some of the interesting places I've visited on my travels abroad. Now that I've returned from my trip to China and once again have uncensored internet access, I'm able to share my stories of travel through an incredible country. I hope you enjoy reading. I have always loved old travel literature like the adventures of Marco Polo so I named my site El Million after Marco Polo's famous book Il Milione (The Million). Like Marco Polo, I am sharing my stories of the million wonders and curiosities of the lands on the other side of the world.